pls buy manila bulletin today (may 11) for your free copy of style weekend! it's our mother's day special! 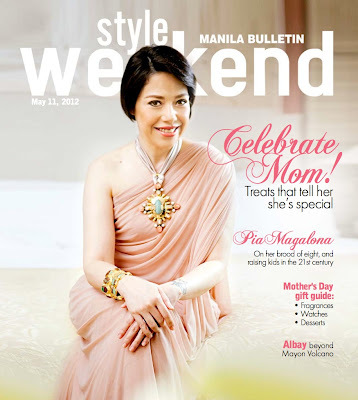 on the cover: the ultimate mom (and grandma, in case you didn't know), pia magalona. photographed by shaira luna on location at edsa shangri-la, makeup by pong niu for MAC cosmetics, hair by eddie mar cabiltes for l'oréal professionnel, styling by liza ilarde. gown by maureen disini, neckpiece by joyce makitalo, cuff by arnel papa. also in this issue: lots of gift ideas and sweet treats for mom!